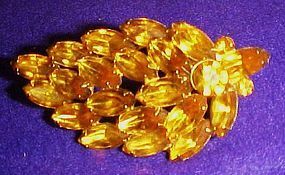 Nice large leaf pin measures 2 3/4" x 1/2", and has amber prong set rhinestones in a gold tone setting. All stones intact and Pefect condition. Nice addition to your autumn wardrobe. Unmarked.